The massacre in Szczurowa was the murder of 93 Romani people (also known as Gypsies), including children, women and the elderly, by German Nazi occupiers in the Polish village of Szczurowa on August 3, 1943. Between ten and twenty families of settled Romani had lived in Szczurowa for generations, alongside ethnic Poles with whom they had friendly and neighborly relations. They were integrated enough into the general community that there were several mixed marriages. On August 3, 1943 German police rounded up almost all the Romani inhabitants of the village and transported them to the local cemetery where they were shot. A list of all the victims has been preserved in the documents of the local church. On May 8th, 1956, local inhabitants of the village and members of local veterans' associations erected a memorial stone with a suitable inscription at the sight of the mass grave of the victims. This became the first memorial commemorating victims of the Romani Holocaust in the world. The memorial is cared for by local schoolchildren and the memory of the tragedy is part of the local historical consciousness. Since 1960, Romanies from Tarnów have been coming to the region to honor the memory of the victims. Since 1996 the International Romani Caravan of Memory travels around the Tarnłw region to commemorate the Nazi mass murder of Romanies during World War II. 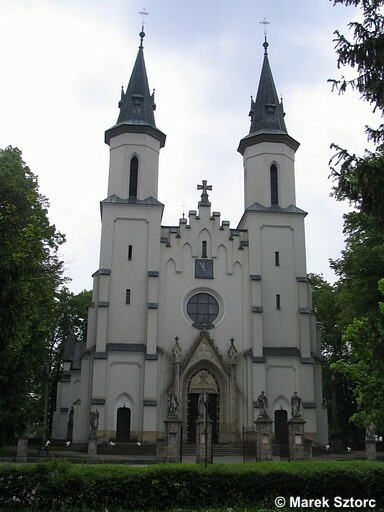 The main stop of the caravan is Szczurowa where after a visit to the mass grave, a mass is held at the local church. The Tarnów region was a site of other Nazi crimes against Romanies in addition to that at Szczurowa. Most of the victim's identities and their place of burial are unknown. Other mass graves of murdered Romanies in the region include those at Bielcza (28 murdered), Borzecin Dolny (28 murdered) and Zabno (49 murdered). The Romani people, who lived in Europe from the 15th century, were among the groups singled out by the Nazi Germany regime for persecution and were often murdered along with the Jews. Between 500,000 and 1,500,000 Romanies were killed by the Nazis throughout Europe during the Holocaust. Ten to 20 Roma families lived in Szczurowa before the Nazis arrived in 1943. They were settled Roma, well enough integrated with the local population for mixed marriages to occur. On August 3, 1943, German military police shot 93 Roma at the local cemetery - almost the entire Roma population. A list of the victims was preserved in Roman Catholic Church documents because all had had been baptized at the church in Szczurowa.